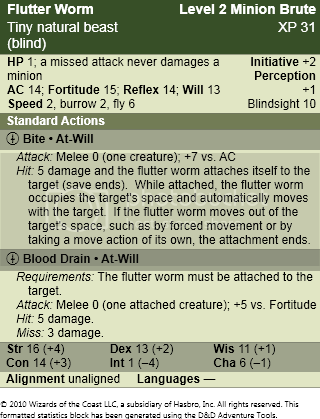 In this week's Wednesday Werk, we'll look at the Flutter Worm. The Flutter Worm is a flying, haematophagous worm primarily found in caves and urban environments, preferring ruined and subterranean structures in the latter. Flutter Worms are frequently found hunting alone, although they typically lair in extremely large groups, typically averaging around twenty or so individuals. Flutter Worms are not known for their intelligence, although some varieties are cunning enough to hunt among urban rooftops, seeking open windows so that they may feed on sleeping prey. Flutter Worms are also known for their unnerving locomotion style; their flight is partially powered by an inherent teleportation ability, meaning that they partially blink in and out of existence while they move. Trained warriors and typical adventurers typically have no problems, but untrained peasants have a tendency to just cut and run. In combat, Flutter Worms attack without regard to themselves, being slaves to their immense hunger. Once a suitable target has been located, a Flutter Worm will latch onto the target using Bite and will then drain blood with Blood Drain until sated. One Flutter Worm is hardly an issue, but a swarm of them tend to be rather overwhelming.